While I don't often show unsuccesful works I thought I'd post this photo of the lost mermaid, This is the third attempt and now I'm wiping her clean to start again tomorrow. It's frustrating when things don't flow nicely, but part of the paint of growing. I'm just glad it happens a lot less frequently then it used to. ....funny, I wrote "paint" instead of pain...well that works! 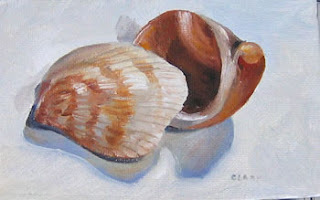 I've been eyeing up some of my shells recently - and I suspect for the same reason! I never agonise over the ones that don't work out. I've given up trying to be perfect with a 100% success rate!